Or, the Welsh version of KTLIT (Knitting Things I Love Tuesday). 1. Berger Cookies. These are so amazing that I eat them for breakfast each day I visit my in-laws (because mom-in-law buys some for us in anticipation of our arrival), and I ask for them in each care package. She sent two boxes in the Easter package, and I shared them with my co-workers, having cut them into smaller pieces beforehand. They were gone in under an hour. Reason? They are a cookie on bottom, and SOLID FUDGE on top. I attribute 10 pounds of the weight I gained in grad school to their fudgy deliciousness. 2. Obsessive Consumption. This is the blog for Kate Bingaman-Burt, a wonderful designer and illustrator. Each day she posts an illustration of a thing she’s bought that day. It’s very cool. 3. Sock yarn in the Blue Moonstone colorway from Blue Moon Fiber Arts. The future color of one pair of Rivendell Socks (I will be making two pairs eventually, since I couldn’t decide which colorway I liked the best. 4. FreakAngels. A brilliant weekly comic that I happened upon via BoingBoing. It’s a great story and it’s beautifully drawn. Updates every Friday. 5. Octopus Tentacle Earrings. I bought a pair of these last week from OctopusMe’s Etsy store, and I love them! They’re clever and subtle and quite beautiful. I will be buying more. I think I posted about these already. They remain awesome. 6. Fearless Fibers sock yarn in Marrakesh. This is the color for the second pair of Rivendell socks. I have difficulty making decisions. 7. A good friend to knit with. This is sappy, sorry, but it’s true. Chickengoddess, you’re awesome, and I’m glad that we both knit. I’ve got a lot of knitterly love for all the other folks I knit with, too. 8. Marian Bantjes’s illustrations/design. Can I be you when I grow up? KTHX. Seriously. I’m in awe. 9. Cocoa butter, nutmeg, and cardamom body bar from Crabtree and Evelyn. Even though I feel like I’m, like, eighty when I admit that I shop there, this bath bar smells amazing. I have no idea what it’s doing for my skin, but I really don’t care. I smell like chai after my shower. So… thanks for listening! I’ll write something pithy and interesting later (first, lunch). 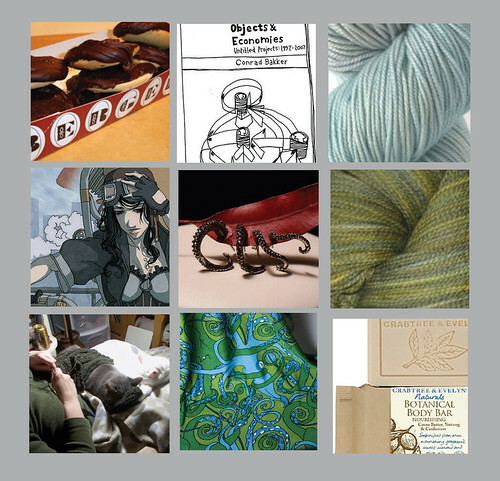 This entry was posted in Cool things, General stuff, knitting and tagged knitting things I love, ktilt. Bookmark the permalink.